Boyne Mountain Resort located in Boyne Falls, Michigan was founded and open for business in 1947 by the great resort pioneer Everett Kircher, and is a part of the Boyne Resorts family. Like their sister resort Boyne Highlands – Boyne Mountain features an even mix of terrain that features 60 runs over 415 acres of terrain catering to skiers and snowboarders of all skill levels. 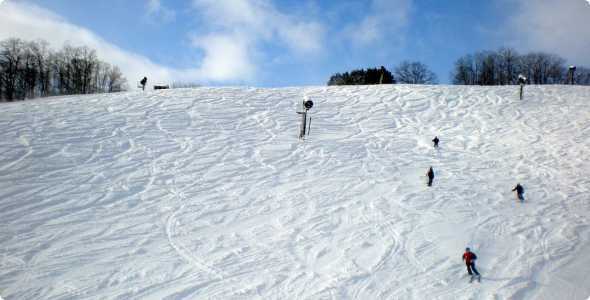 When you purchase a ticket, you have full access to both Boyne Mountain and their sister resort Boyne Highlands. Ticket and rental prices do vary depending on the time of season, check with the resort for up to date pricing. Purchase your daily lift ticket at an “off resort” Boyne Country Sports location and receive a $4 discount. Boyne Mountain boasts a family atmosphere both on and off the mountain including Avalanche Bay, an 88,000 square foot indoor water park. Boyne Country Sports, the resorts full service ski shop features the latest equipment along with ski and snowboard repairs, tuning and waxing.